so why should we take issue over things? heaven and hell exist in a single moment’s thought. but the physical body still remains a vehicle for spiritual practice. they can transform our defiled body into a pure body. Many people think that engaging in Buddhist practice is something profound and mystifying. Since the teachings are so deep and the journey of practicing them is so long, where do we start? In actuality, the Buddha-Dharma is very easy to understand. It is taught for all sentient beings to use; it is present right here in our everyday lives. But what methods must we use to ensure that our minds will resonate with the Buddha-Dharma? I often say that we must make the Buddha-Dharma applicable in daily living. When we are truly able to follow the Buddha-Dharma in everyday life without ever deviating from it, we will be able to adapt it to the different capabilities of the myriad sentient beings. It is said that sentient beings have 84,000 types of capabilities, and every being has different beliefs and ways of thinking. Because of this, the Buddha used his wisdom to develop all kinds of skillful means to suit our individual needs, thereby ensuring that we would be able to make use of the Buddha-Dharma in our everyday lives. This is what it means to make the Buddha-Dharma applicable in daily living. 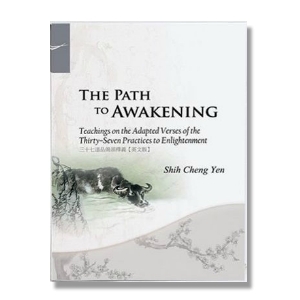 The Thirty-Seven Practices to Enlightenment can resonate with sentient beings of different capabilities, for these practices are intimately connected to our daily lives. Whether our capabilities are sharp or limited, we can all gain insight and inspiration from these thirty-seven methods for attaining Bodhi. The Thirty-Seven Practices to Enlightenment teach us how to form aspirations and help us resolve the confusion and delusion we encounter in life. They provide a way of maintaining our clarity amidst this chaotic and turbid world, ensuring that our minds remain pure, lucid, and free of delusions. If we can attain this mindset, with each step, we can steadfastly approach the ultimate state of Buddhahood. The first section of the Thirty-Seven Practices to Enlightenment is the Fourfold Mindfulness. These four methods focus our thinking to help prevent us from giving rise to discursive thoughts, thus enabling us to realize the true principles. Where does karma come from? It comes from having a body. Because of the body, we give rise to attachments from greed, anger, ignorance, arrogance, doubt, and so on. Having these attachments, we constantly create karma and thus perpetuate our suffering. In order to liberate ourselves from this state of suffering, we must begin by practicing the Fourfold Mindfulness: We must contemplate the body as impure, contemplate all feelings as suffering, contemplate the mind as impermanent, and contemplate all things as having no self. We need to start with these four methods of self-examination. In any situation we encounter, we should always examine our state of mind and earnestly apply our wisdom toward examining ourselves. To examine is to contemplate. In other words, we must carefully observe the conflicts in our external environment and clearly discern right from wrong, only coming to a conclusion after careful consideration. This is what it means to contemplate a situation as it is and to carefully examine all the principles of life and the universe. The Buddha is an enlightened, noble being; his mind is in total resonance with all true principles. He not only understands the truth about the universe, but can also see through the workings of the human body. If we can dedicate ourselves to thoroughly understanding the body, we will realize that this body is impure and will not last forever. Life ends when we stop breathing. The body is nothing but innards covered by a layer of skin, and it only works as long as we are still alive and breathing. While we are healthy, so long as we take good care of it, this “smelly sack of skin” will remain functional. However, this is only temporary. As soon as we stop breathing, the body will quickly decay and become unbearably rotten, filthy, and putrid. Even while we are alive, our nine orifices constantly discharge impurities like snot, mucus, saliva, and so on. All of these filthy and impure things originate from within the body. When we think about it this way, what is there to love about the body? There really is nothing to love, and yet countless people are so deluded that they take issue over all kinds of things for the sake of this “sack of skin,” creating karma because of this body. Truly, it is not worth it! As soon as we are born, we start to have all kinds of attachments to our bodies. Babies are born crying. As soon as they leave the mother’s womb and come into contact with the air, it is as if their skin is pierced by freezing cold, and they feel pain down to the marrow of their bones. This is why babies wail so loudly. After they have been cleaned up, once the babies are accustomed to breathing on their own, they start crying for milk. The desire for food is the first desire babies experience after they are born. From then on, they begin to give rise to all kinds of cravings. They will desire clothing, for a place to live, for means of transportation, and so on. This continues on until they grow old and die—truly, there is no end to these desires. Desirous thoughts cause the greatest sufferings in life. It is because of the body that we are endlessly entangled in all kinds of desires. Therefore, as Buddhist practitioners, we must constantly be vigilant of the thoughts in our minds. The Fourfold Mindfulness is about developing our wisdom of contemplation. We must constantly contemplate the suffering of the mind and body and rouse our minds to examine our lives; only then will we be able to develop our wisdom. With wisdom, we will be able to delve into all phenomena in the world and attain liberation from the source of life’s suffering. As the weather changes along with the seasons, the body must also accept the discomfort that these changes bring. Thus, our body suffers. In hot weather, the body will sweat profusely. If we do not shower every day, our bodies will become unbearably sticky and odorous. In cold weather, body heat will quickly dissipate. If we are not careful, we are bound to catch a cold. The nose will run and we will become congested. We keep discharging dirty things like snot and phlegm. When the body is unwell, we discharge all kinds of dirty things, causing us to feel pain and suffering. There are also accidents every day that result in deep cuts, broken bones, and festering wounds. People who once looked healthy and beautiful may become disfigured. Their complexions turn sallow, their bodies swell with fluid, their bellies bloat, and their limbs become deformed. All we have to do is take a walk around a hospital, and we will experience the suffering and helplessness caused by illness and injury. Thus, contemplating the body as impure helps us to realize that all suffering in life inseparable from the actions of the body. By contemplating this, we will no longer cling to any of our worldly desires. Instead, we will be able to make good use of our bodies and our potential for goodness.